2015 update – Carbon remains open but no longer accepts affiliate signups, so we can no longer offer support or exclusive promotions. For a rakeback-friendly room, we recommend Americas Cardroom. Carbon Poker offer regular reload bonuses on a monthly basis, whatever the year. Simply top up your account with a real money deposit and earn a bonus, to be unlocked as you play and earn VIP points. See our feed of poker room bonus codes for the latest active offers. As a frequent player, you’d put in the required volume of play to clear each bonus anyway, so reload bonuses really are free money. 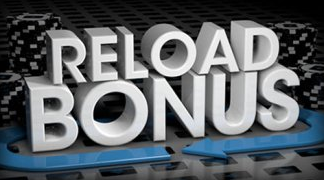 Released into your account in increments (typically $5 for every 750 VIP points you earn, or $10 for 1,500) reloads are a welcome source of additional rewards – typically 6.67% extra rakeback, the same as your initial deposit bonus. When it expires – most players will fail to clear 100% of their bonus – the next reload offer is never far away.